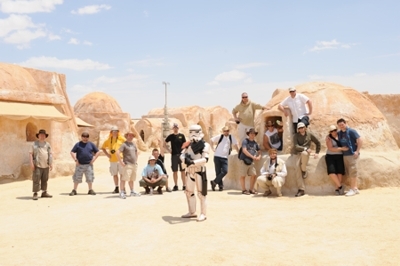 This is a detailed guide to show you all the locations you will need to visit to get a feel for the planet Tatooine. On these pages you’ll find loads of photos, categorized per day and per location visited. Simply click on the thumbnails for the full size photo and enjoy! When copying any of the photos, please be so kind as to provide a link to this website as the rights to the images belong to the respective Pioneers. Colin, Ross, Rich, Terry, Markus, Bret, Chris, Michael, Claus, Mark, Scott, Robert, Zack, Imanuel, Franz, Sarah & Mark. Click here to go to the first page of photos or choose any day you wish to see from the menu on in the left sidebar.